Dunkirk is perhaps unprecedented in how it feels intense from start to finish. This was very much by design, as the film was written and scored so that it would be intense essentially ad infinitum. 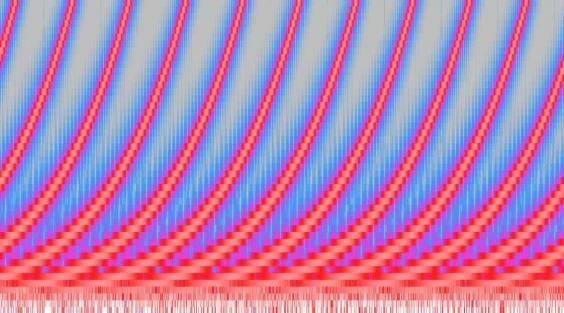 Enter the Shepard tone, an auditory illusion consisting of a superposition of sine waves separated by octaves. As Vox explains in its brilliant explainer video above, it sees a middle octave scale at constant volume, a top one fade out and a bottom one fade in, tricking the brain when played on loop and creating a sense that pitch is only going up and up up and up and up. Supercomposer Hans Zimmer used the Shepard tone extensively in the Dunkirk score and it is also found in several other Nolan films. He is clearly fascinated by it (its illusory nature feeling akin to his general obsession with the non-linearity of time and space) and even influenced how he wrote the screenplay for Dunkirk, a film which consists of three storylines that you could think of as three octaves. “There’s an audio illusion, if you will, in music called a ‘Shepard tone’ and with my composer David Julyan on The Prestige we explored that, and based a lot of the score around that.“It’s an illusion where there’s a continuing ascension of tone. It’s a corkscrew effect. It’s always going up and up and up but it never goes outside of its range.